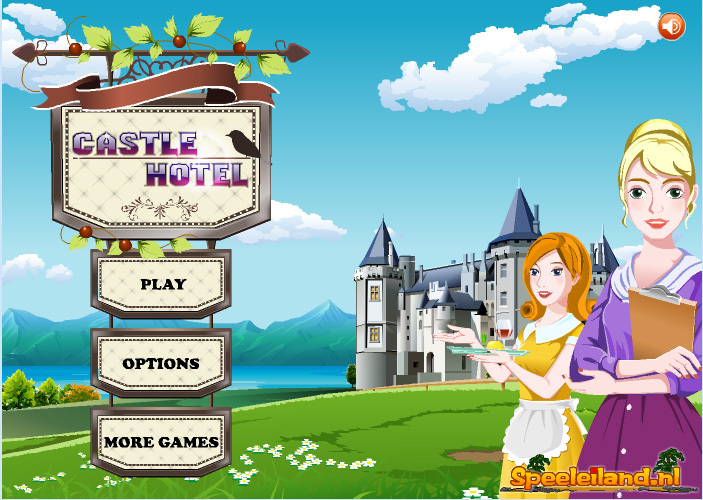 Manuela and Melvin have bought an old castle, and have completely renovated it to transform it into a hotel. It’s an exciting period for them, because after having made lots of efforts and investments, the time has finally come: the hotel will be opened! Now it’s the question if the hotel will be successful, and if they’ll earn enough to repay their investments. If they don’t succeed, the hotel will go bankrupt and all effort has been in vain. Together with their loyal employees Bessie and Bill they’re going to do their utmost to make it something successful and to satisfy their guests. So it’s very important that their guests are served hand and foot, and that they get what they ask for as quickly as possible. Will you lend Melvin, Manuela, Bill and Bessie a hand? Click on the items your guests ask for: if they ask for the keys, you click on the desk where the keys are kept and then click on your guests again; if they order a cup of coffee, first click on the coffee machine and then click on your guests. If something needs to be cleaned or repaired, you can click down on the left or right in your screen. When your guests are satisfied, they’ll pay their stay (don’t forget to click on the money they put on your desk). With this money, you can do more investments in a next level. This allows you to open more rooms, decorate your hotel with plants, and put newspapers, phones and other things at your guests’ disposal, so that their stay in your hotel will be even more comfortable. Obviously it will become busier and busier in the hotel, and you’ll notice this by the speed you’ll have to react. Good luck!